"Postman Postman don't be slow! I'm in love with Cyn, so go man, go!" - John Lennon on envelope to Cynthia. "It's not like we denied it. It's just no one asked us." 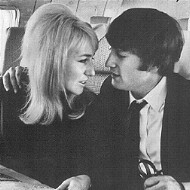 - John Lennon regarding marriage to Cynthia. "John needed to escape his reality. I understood completely but I couldn't go along with him." - Cynthia Lennon regarding John's drug taking. "The beginning of the end." - Cynthia Lennon regarding John's drug taking.